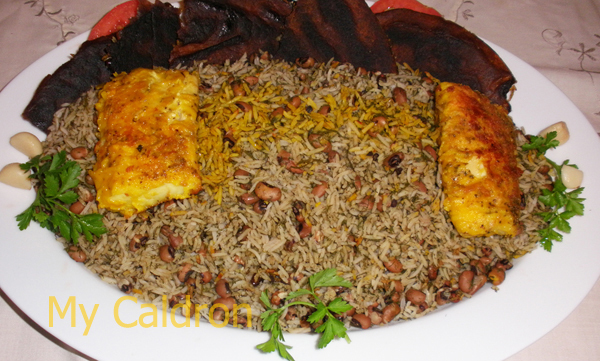 I can eat this mix-polow as a complete main dish, but it is very common to have it with fried fish in the southern part of Iran. It might also be served with large chunks of boiled or baked beef or even fried and steam-cooked chicken. Black eye beans, 1 cup. Dill, 1 bunch washed and chopped + 2. tbsp. dried dill (combination of fresh and dried herbs works best, but you can also use one or the other). Cooking oil. Salt. Saffron, 1 tea spoon. Method: Wash black eye beans and cook in a small pot with two cups of water and a pinch of salt until done (but not too soft). Discard excess water, if any, and put aside. Prepare rice in usual way (soaked in salted water, drained, boiled in lots of water, drained, and steam cooked). At the stage when rice is in the boiling water add 2 tea spoons of turmeric to the water. Drain the rice at the appropriate moment (when rice is cooked at the core) and once it is in colander mix it with your cooked beans and chopped dill, by shaking the colander hard a few times (do not stir; you can mixed them thoroughly when you want to transfer mixed polow in to serving dish). Sprinkle powdered saffron on the top of the mixed polow before letting it steam cook for at least one hour. The steam releases saffron’s taste and colour. However, a more conventional way of using saffron is to soak it in warm water for 15 minutes and mix it with a small portion of rice and then use that portion as garnish on top of the serving dish. Fish: Wash, drain, and pat fish dry with paper towel. On a large clean surface mix white flour, turmeric and some salt and roll fish in this mix. Warm 2 tbsp. of oil in a frying pan and fry both side of each fish on a medium to high heat (frying time depends on the type of fish. In any case it should not take more than 15 minutes to have a well-done crispy fish). Keep them warm in oven if you have to, but do not put them in the same pot as the rice or in microwave, asthey would go mushy and unpleasant. Serve in the same dish as rice, or separately. سلام..مادر ازشما تشکر کرد..او تا حالا دو استفاده از اینجا کرده….